Home All Universities Admission Guides JAMB UTME and DE Guides Universities that Don’t Accept Admissions for Nursing and Public Health This Year. Candidates Beware! Universities that Don’t Accept Admissions for Nursing and Public Health This Year. Candidates Beware! Nursing is one of the most competitive courses in Nigeria. Perhaps because of the beautiful nature of the profession after graduation or because you may not spend years at home in search of jobs after leaving the university. 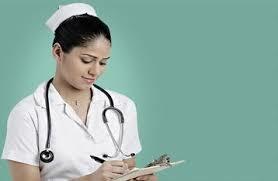 Nursing is undoubtedly an evergreen course when it comes to the societal needs and demand among the admission seekers. Especially when you ask a short, moderately short and fair-complexioned science school leaver, she is more likely to tell you she prefers Nursing and Nursing Science in her choice in UTME/DE. However, most candidates blindly proceed to CBT centres after obtaining e-PIN to fill forms and chose any available schools offering nursing. I think it is high time, JAMB found a way to enforce all CBT centres to study brochure very well before filling the forms for our admission seekers. And if that is not feasible for now, the system should be designed in such a way that when a course is chosen during the registration, the correct subject combinations should automatically be up for the course. In other words, machines should be able to fill the required subjects for a course automatically. It’s disheartening to see students scoring higher marks in UTME and because of wrong subject combination they must write next UTME or be forced to change their courses. Another issue is when some schools say they won’t be taking in students for a particular course in a year. This may be surprising but it is real. 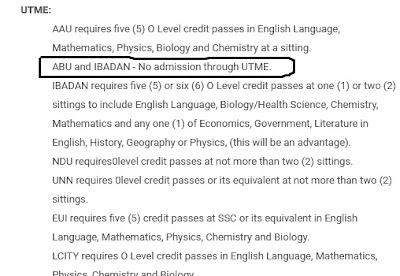 However, JAMB may still open form for such courses which may mislead such admission seekers - thereby lose admission for the course or the year. Which School Says No Admission This Year For Nursing? I was studying JAMB Brochure for a client’s daughter proposing Nursing in a university, when my eyes caught a notice on the live/online JAMB brochure. Guess what! Two key universities that our students are chasing for this year admission may not accept applicants for Nursing through UTME this year. The two universities are The University of Ibadan and Ahmadu Bello University, Zaria. Well, as far as the JAMB UTME and DE are concerned, an admission seeker has no better place to look for realities than in the brochure. If you are curious to confirm this, visit the online JAMB brochure and check Nursing and Nursing Science. 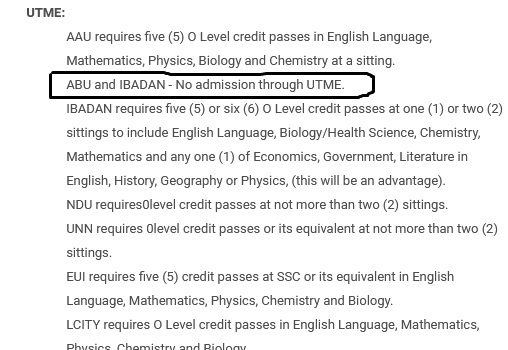 Then, scroll to part where JAMB talks about UTME. The notice is there. I don’t want to doubt if JAMB brochure will be mistaking on this matter. What Should You Do If you are Concerned About this? First, I had tried reaching out to JAMB supports but no reliable information gathered yet. You can as well try the support channels. I will keep finding ways to confirm the latest and update you if you can just subscribe to this blog for future updates. However, you may proceed to the two schools in question to confirm if they will ACCEPT applicants for the NURSING this year. Don’t do online searching for answers to this. Internet is full of fake news these days and I bet you know that. Go to the school’s admission office for the real information. They will be willing to help. Why should you believe or ignore this information? JAMB Brochure is the first official and recommended source of information. Hence, anything from that text should be taken authentic. JAMB started the online version of her brochure in order to keep the information, therein, fresh and updated which is not available to paperback or CD type. From my experience, JAMB may say something and the school concerned may be doing another. This can happen if JAMB has not updated their brochure in accordance with the latest school’s requirements. I don’t have the reconfirmation from the schools concerned yet if the information in the brochure is stale or still in effect. This is why I recommend you to visit the school's admission office for the real deal before choosing the course. Be sure you check the online JAMB brochure to see if the information still remain there or it has been updated before you can make your decision based on my writing. You can be reading this post after JAMB has effected some changes in the brochure, kindly check first. If you must insist on Nursing but can't go to the extent of visiting the school's admission office, you can consider any of other universities offering Nursing and Nursing Science.